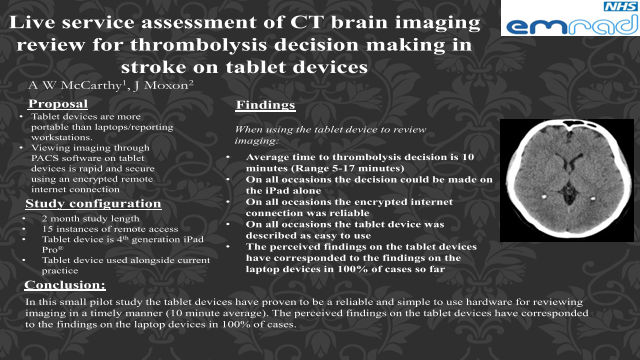 Abstract: Results of the “ZFP Tablet review of CT imaging for thrombolysis decision making in stroke” pilot at ULH. 2 months of data collection. Stroke physicians to use the tablet device as part of a “real-life” oncall, where imaging is reviewed on the tablet alongside the current practice (laptop device review) in the context of thrombolysis decision making. The tablet is a 4th generation iPad Pro. The use of tablet devices to review CT imaging remotely will be more timely than the current system of reviewing imaging on trust laptops, as well as providing a more portable alternative hardware option. Tablet devices will prove to be a reliable and easy to use when reviewing imaging in a time critical manner on trust WIFI or through an encrypted remote internet connection. 15 completed forms for when the tablet device was used alongside the current practice by 3 of the 4 stroke physicians at Lincoln County Hospital. To date a patient whose scan had a contra-indication to thrombolysis has not been reviewed as part of this pilot. I have attached more subjective data in the form of participant’s comments so far for review highlighting a couple of key themes. In this small pilot study the tablet devices have proven to be a reliable and simple to use hardware for reviewing imaging in a timely manner (10 minute average). The perceived findings on the tablet devices have corresponded to the findings on the laptop devices in 100% of cases so far.